Hendricks, Barbara. Lifting my voice; a memoir. Chicago: Chicago Review Press, 2014. viii, 488 pages. Foreword by Kofi A. Annan. (An A Cappella Book). ISBN 978-1-61374-852-7. Probably the name of Barbara Hendricks surfaced for many American music lovers initially with the LP of Final Alice, by David del Tredici (London LDR 71018) or the reissue on CD (Eloquence 4429955). In either case, this would have been with the Chicago Symphony Orchestra, conducted by Georg Solti -- the same performers who gave the work its première in 1978. Or might have been the Mahler fourth symphony on Decca, 0289 430 7562 6 DH from 1979. Then there was joyous collaboration with Moses Hogan from 1998 (EMI Classics 7243 5 56683 2), a collection of 20 spirituals. She made a very strong impression when she sang "Signore, ascolta" and "Depuis le jour" at a Nebraska state audition for the Metropolitan Opera when she unexpectedly won first place. 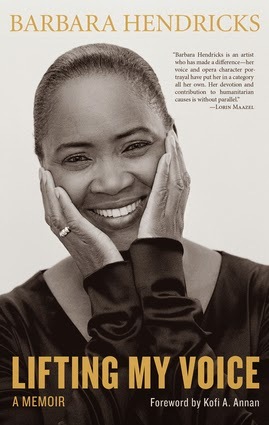 This sent her to the regional competition in Minneapolis in 1968, but it was felt at age 20 she was too young and inexperienced to proceed to the finals in New York, despite acknowledgement of her gift (the 1968 national winners were Jessye Norman, Nancy Shade, Ruth Welting, and Loretta Ziskin). Her affiliations with the Met have, strangely, been minimal. She appeared in 12 performances of Virgil Thomson's Four saint in three acts, all presented at the Vivian Beaumont Theater in the first few months of 1973; in 1987 [1986 is the date stated in Lifting my voice, page 474], now in the Met's hall, she gave 11 performances as Sophie in Der Rosenkavalier, returning in 1989 for only four performances of Le nozze di Figaro, a work she had recorded for Philips four years earlier with Neville Marriner. Of course there was the performance of Porgy and Bess at the Blossom Music Festival in 1975, recorded then for Decca (60911) and subsequently reissued in 1995 by Musical Heritage (533942F). There were performances she had offered in the United States after her career exploded internationally, but she moved to Europe in 1977. Her European engagements had then become so numerous that this must the reason why she had to limit her performances in the United States -- D'un aspace déployée by Gilbert Amy in Chicago, 1974; The cunning little vixen by Janáček, Santa Fe, 1975; Town Hall debut recital in 1976 and the première in Chicago of Final Alice; her Met debut ten years later in Der Rosenkavalier; a return to her alma mater, Nebraska Wesleyan University in 1988 for an honorary doctorate and her Met portrayal of Mozart's Suzanna; in 1993 for the presidential inauguration of fellow Arkansan Bill Clinton; in 2000 for a honorary doctorate from Julliard and the next year to sing for Kofi Annan's receipt of the Nobel Peace Prize. Americans have thus been obligated to experience her artistry to a large extent from recordings, of which there have been many. Lifting my voice sketches most of these in an appendix, "Complete discography of Barbara Hendricks," but it does not satisfy that claim. At least two CDs are missing: Musical Heritage 513725Z, probably a 1992 reissue, Great American spirituals), which she shares with Kathleen Battle and Florence Quivar, and Telarc's CD-80407 from 1994 (Divine sopranos) , where she appears only once, with "Ach, ich fühl's" from Die Zauberflöte. Even more frustrating for the serious collector are the scanty discographic details, especially the absence of contents. Our intent to rectify this will be submitted for later posting at chevalierdesaintgeorges.homestead.com/. Because these memoirs have the potential of a valuable scholarly resource, one might lament the absence of a bibliography, and the inclusion of a more comprehensive chronology, and a less selective index. The latter point becomes an issue particularly because the biography covers more territory than music, with reference to many figures -- not only musicians -- and as a result should be of interest to those engaged in civil rights (not just American) and the political scene. In fact, her international work for human rights (and not as an attached personality, but as one who was in the battlefield) is significant enough to merit the attention of non-musicians. Ms Hendricks, magnificent that she is, has not been a typical singer. Before others encouraged her to take her voice seriously, she had majors in chemistry and mathematics as an undergraduate. In her rural Kansas childhood, she was painfully aware of the social and political turmoil evidenced in assassinations and protest marches that stimulated her activities for human rights, including women's liberation. Perhaps responding to her parents' orthodox attitudes, she developed a philosophy totally of her own, iconoclastic when need be, one in which all her observations and experiences gave her nurture as an activist and true liberal (in times when that quality was not being redefined as an obscenity). These attributes are present, not only verbally in her story, but in her decisions and actions as a human. Her extraordinary wisdom shines through in her dealing with her public, her family, and her career. The musical aspects of this narrative have an implicit importance for aspiring singers. Not only in terms of obeying the nature of one's voice (regardless of an individual's interest), knowing how to evaluate a voice teacher, dealing with a vocal coach, with management, health, photographers, the press, promotion, the public, record companies, rival sopranos -- all this is treated, not as a text book, but as elements within the life story, making this an important guide for students and young professionals. She is careful not to identify any who were problems, yet totally honest in her coverage of EMI, her first major record label (EMI subsequently was taken over by Warner Brothers, but she has been unable to acquire rights to her many EMI recordings for reissue on her own label, Arte Verum). The evolution of her life, from the most humble beginnings to that of a major artist and highly respected figure in diplomacy, is a significant drama, recommended on that basis alone to all who grew up in a Jim Crow environment, as well as those who can only imagine what that was like. This self-portrait is too honest and candid to be thought self-serving. A great musician? Yes, she is that because she had the wisdom to respond to her gift, but her reactions, decisions, and philosophy betray a very warm, compassionate, and genuine human, and that is even more important. PS. I think almost every infinitive in the book is split and there are various other grammatical errors (specifics available). BH took pride in her grammar and might be very distressed by their presence here.